On Monday 6 November 2017, St Andrew’s Foundation attended the formal handover of a new ambulance to the Emergency Department of the Upper Silesian Child Health Centre in Katowice. 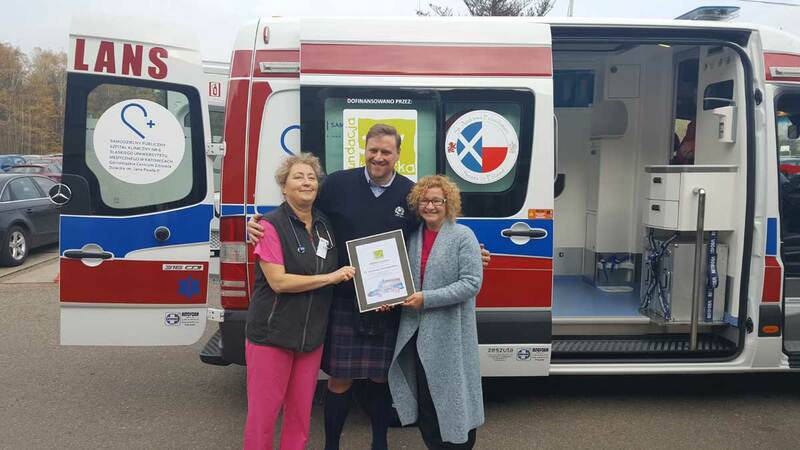 From donations made at the 2016 St Andrew’s Caledonian Charity Ball we donated PLN 80,000 through Fundacja Iskierka towards the cost of the new ambulance. Fundacja Iskierka donated a further PLN 40,000 from their own funds towards the total cost of PLN 300,000 for the fully equipped ambulance. 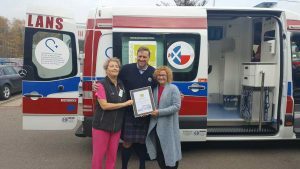 Iain Leyden, who represented the St Andrew’s Foundation was presented with a certificate acknowledging Foundation’s donation. The presentation was made by Pani Jolanta Czernicka-Siwecka, Prezes of Fundacja Iskierka. Head of the Childrens’ Emergency Department, Dr. Barbara Kunsdorf-Bochnia, who also attended the presentation said that the new ambulance had already been put to work and was saving lives! 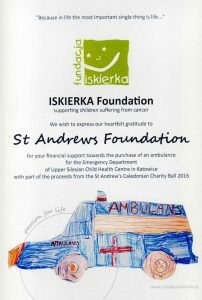 We hope that if you are a guest at the St Andrew’s Caledonian Charity Ball at the Warsaw Marriott Hotel on Saturday 25 November you’ll dig deep into your pockets, purses and wallets for the fabulous array of raffle and auction prizes- your donations support our charitable objectives and make a difference to childrens’ lives. 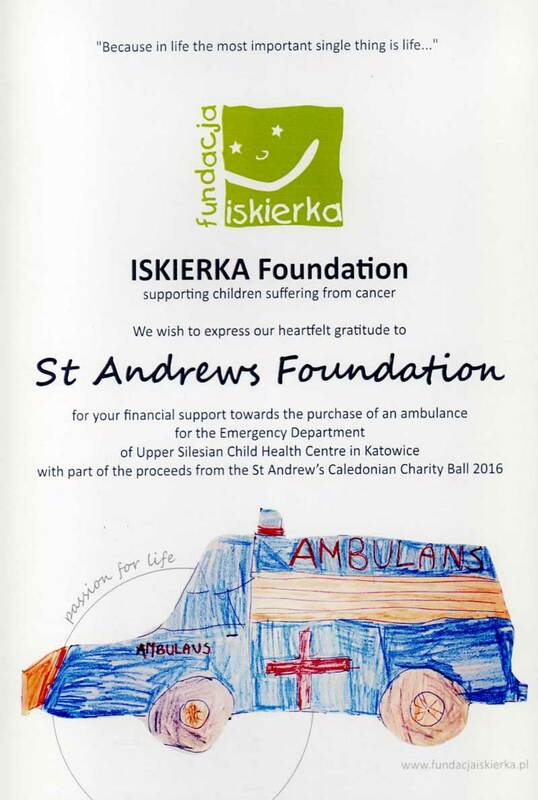 ambulance, Charity Ball, Childrens' Charity, donation, Fundacja Iskierka, St Andrews Foundation, Supported charity. Bookmark.